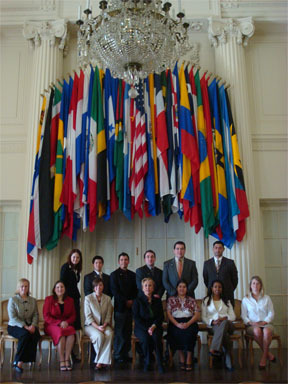 Continuing its tradition of excellence, the Baylor University Model Organization of American States (MOAS) team shone at the recent Washington Model Organization of American States conference held at the Organization of American States (OAS) headquarters in Washington, D.C. from April 8-12, 2008. OAS Secretary General José Miguel Insulza addressed the inaugural session of the meeting in the Hall of the Americas. His speech emphasized work done by the OAS in strengthening democracy and preserving peace in the Americas and also highlighted the role the Foreign Ministers played in working toward a diplomatic solution in the recent Ecuador-Colombia dispute. Ambassador Héctor Morales, the U.S. Permanent Representative to the OAS, gave the closing speech in which he explained the OAS role in hemispheric development. Universities participating in the model included nineteen U.S schools and ten foreign universities from Argentina, Chile, Colombia, Venezuela, Nicaragua, Guatemala, Mexico and the Bahamas. Baylor students represented the country of Guatemala and met with Guatemalan Chargé d’Affaires Otto Pérez and his staff. At this model, Baylor student Cassidy Ford, a Junior University Scholars major from Phoenix, Arizona, chaired the Third Committee which focused on Summits, Civil Society, and the Inter-American Council for Integral Development. Another Baylor student, Manny Muñoz, a Junior Neuroscience major from San Antonio, Texas chaired the Fourth Committee on Administrative and Budgetary Affairs. Joshua Hyles, a Senior Archeology/History major from Corsicana, Texas, coordinated and introduced the Joint Declaration that faculty coordinators selected for debate in the Hall of the Americas. Hyles’s committee also elected him chair of the Fourth Committee for next year. The General Assembly elected Co-Head Delegate Seth Reed, a Junior Political Science major from Cassville, Missouri, as President for 2009. This marks the fourth time in eight years that a Baylor student has been elected president of the model. Other team members included Co-Head Delegate Megan McNerney, a Junior International Studies major from Troy, Ohio; Renee Sanchez, a Sophomore Spanish major from Brownsville, Texas; Krystal Dau, a Junior International Studies major from Las Vegas, Nevada; Tezita Getachew, a Senior International Studies major from Dallas, Texas; and J.C. Cortez, a Senior International Studies major from Mt. Pleasant, Texas. Eva Silkwood, a graduate student in International Relations from The Woodlands, Texas served as graduate assistant to the team’s director, Dr. Joan E. Supplee, from the Department of History.